A musical guided tour through British Christmas customs. An Albion Christmas has been touring for nearly 20 years, selling out many venues across the UK; in fact, some people say that their Christmas doesn’t start until they have seen the Albion Christmas show! The Albion Christmas show is a seasonal mixture of carols, spoken word, humorous readings and dance presented by the founder of Fairport Convention, Steeleye Span and The Albion Band, Ashley Hutchings, alongside fellow folk music luminaries, Simon Nicol, Kellie While and Simon Care. Folk enthusiasts will know Kellie from her work with The Albion Band. She received personal praise from Ron Sexsmith for her beautiful version of his song ‘Riverbed’ on her album Tenacious, which put her on the map as a soloist. Simon Care is currently working with Edward II and has always had a passion for Traditional English dance and song. Simon has also worked and recorded with Show of Hands, Whapweasel, Tickled Pink and the Lark Rise Band. He is also a world expert at the comical Monkseaton Egg Dance. Simon Nicol, founder member of Fairport Convention is regarded as one of the finest acoustic guitarists in the world. His voice is pretty special too! This evening of traditional English Christmas music, dancing and celebration really is the perfect way to start your festivities and is suitable for all ages. An Albion Christmas is at The Apex on Thursday 20 December at 7.30pm. 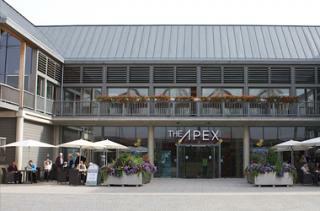 Tickets are £21, ring the box office on 01284 758000 or see www.theapex.co.uk for more information or to book.